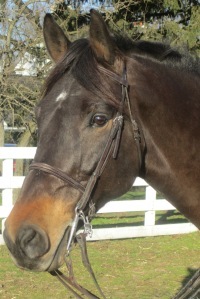 Daniel used to be an adult amateur horse and did equitation and hunters for years on the national circuit. He’s incredibly versatile—well-schooled in hunters, equitation, and dressage—making him the perfect mount for a rider competing in all three divisions. Daniel won the 2011 Gleneayre Hunter Derby. He’s not fond of being groomed, snuggled, or wearing his blanket; occasionally he’ll prick his ears forward and accept a pat on the neck to let you know he loves you.